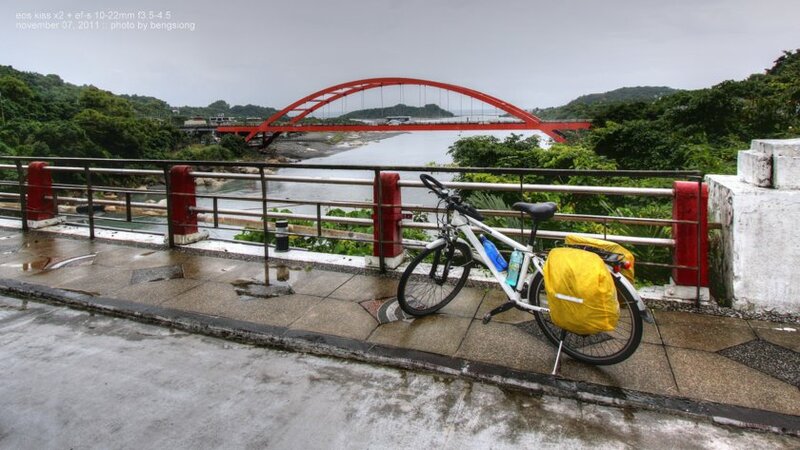 I first learned about Giant Taiwan’s flexible multi-day bicycle rental option from this blog, which allows one to rent and return the bicycle at different stores throughout Taiwan, while searching for information for an upcoming Taiwan trip. Surprisingly, there isn’t any official information in English available from Giant online with regards to the multi-day bicycle rental options, not really sure why? 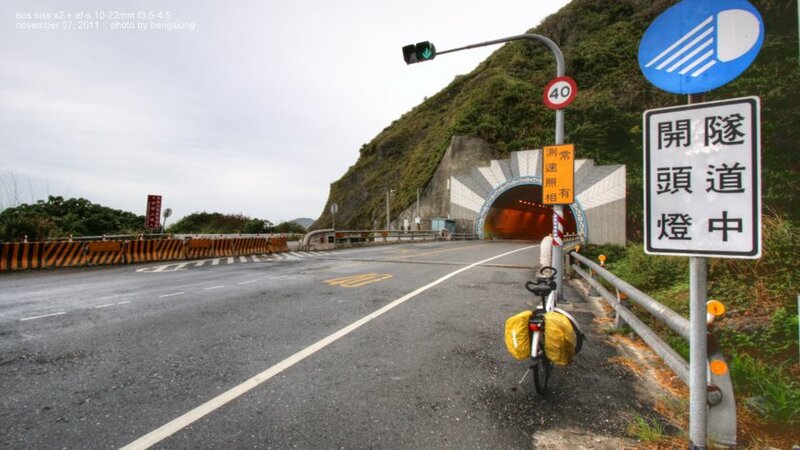 It is certainly a great option for visitors from other countries who would like to cycle long-distance around Taiwan, but finds that bringing their own bike in is too much of a hassle. After confirming that the rental program is indeed still available, I decided yes, I wanted to spend a few days on a cycling trip for a slightly different vacation experience. 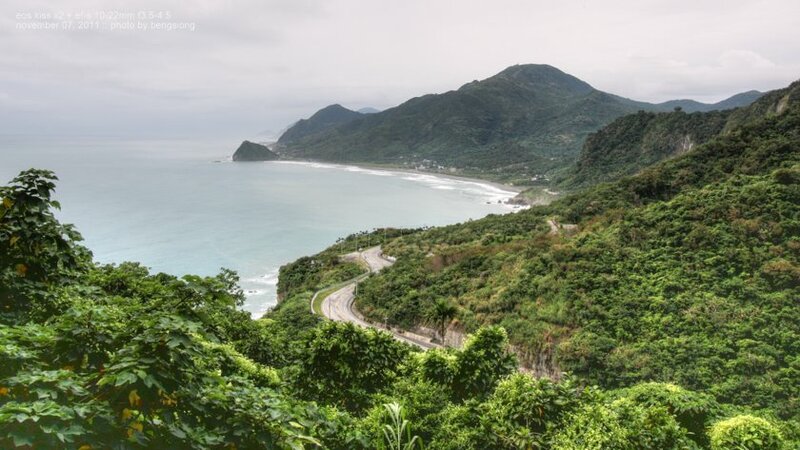 Generally for first-timers who has only a few days to cycle around Taiwan, the east coast area along Taitung and Hualien is the top recommendation due to among others, the beautiful sceneries and roads with wide shoulders and less traffics. 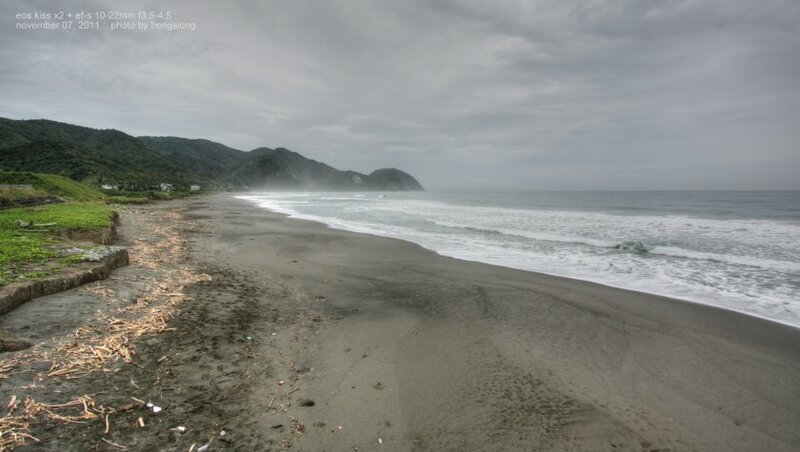 There are 2 major highways connecting Taitung and Hualien: Highway 9, which runs inland along the East Rift Valley, and Highway 11, which runs along the coastline, with a mountain range in the middle separating them. There are multiple cross-mountain roads connecting the two highways at various places along the length, so one can either do one or combinations of both. Also of note is that, Route 193 that runs parallel to Highway 9 from Yuli into Hualien City is highly recommended over Highway 9 at that stretch due to much less traffic, and the rolling terrains combined with the countryside sceneries makes for a more exciting ride, compared to Highway 9 which has many big trucks passing through. I had made a reservation a week before travelling to Taiwan by calling the store near Hualien train station that I wanted to rent from. The staffs at the store (at least the Hualien store) do not really speak much English, so if you can’t speak Mandarin, get someone who can to help make the reservations through phone for you. Generally you should make a reservation at least a week in advance to ensure availability. The current rental charges for the multi-day rental options (the staffs refer to this rental option as ‘huan dao’ – round-island) are NTD 1200 for the first 3 days, and additional NTD 200 for each subsequent days. A credit card is required to guarantee the rental. Although there are a few different bicycle models listed in the rental sheet (Great Journey 1, Great Journey 2, and CRX), the Giant Hualien shop appears to have only Great Journey 1 on offer. One nice thing about the Great Journey 1 is the ‘butterfly’ (trekking) handlebar, which provides for plenty of different hand positions compared to a flat bar, for better comforts during a long trip. But for those who prefer a 700c set-up, you may need to enquire at other Giant rental shops for the availability of the CRX model. Helmet is not actually included, but just asks for it – the shop can provide one for you without extra charge. Other things that are not included but which I think are essentials, especially if you’re making the trip on your own: spare tubes or patch kit, and tire levers. These can be purchased from the shop, or bring your owns'. I decided to use Hualien as my base although Taitung is actually closer as I was coming in from Kaohsiung. Well, either way, I will need to leave my big suitcase somewhere and return for it again later after finishing the cycling trip anyway. In terms of logistics, Taitung train station is a fair bit away from the city center compared to Hualien, which is a little inconvenient when you’re dragging a big suitcase and trying to save a few extra bucks by not taking a taxi… I discovered later that there is actually another viable alternative to handle the extra luggage – ship them from one 7-11 to another 7-11 in your destination via the forwarding service, although I didn’t make use of this option. I arrived at around 4pm at Hualien station from Kaohsiung on the Tze Chiang Express #231 train, which leaves me with plenty of times to check-in at the hostel first before heading back to the Giant store near the train station to pick up my bike (the store closes at 6pm). I purposely rented the bike a day earlier so that I can start my trip early in the morning, as the store only opens at 9am on weekdays. En-route on the train, had the famed Chishang ‘bian-dang’ (NTD 70) for late lunch. The train stops at Chishang station for only 1 minute, so one has to quickly get down to buy the lunchbox from the sellers scattered around the platform, and then get back onto the train. In Hualien, I stayed at Sleeping Boot hostel, around 15-minutes’ walk from the train station. It is located midway between the train station and the city center. I would highly recommend this hostel to anyone, if only for the friendliness and helpfulness of the hostel owners. The hostel is run by Fong and his sister (I’m sorry I kinda didn’t get to know her name? ), who take turns to be at the hostel welcoming visitors. Clothing and other essentials packed in waterproof plastic bags in the rear pannier bags, and my DSLR in the backpack, I set off from the hostel at around 6.15am – half an hour behind my original schedule. Was debating with myself late into the night prior, worrying about how much will be too much (or too little) to pack for my first ever multi-days cycle touring, short as it is. The sky, overcast, with hints of imminent rains approaching. The hostel owner (Fong) had warned me last night that there is a forecast of rain coming, which I hope will be wrong. No such luck, as I later discovered. Made a right turn at the corner with KFC/McDonalds into the city center, and stopped at the first Family Mart for a light breakfast of sandwich and coffee, as well as stocking up on some Snickers bars, a bottle of Supau and another of plain water. Moving onwards, turned left at a major crossroad, which should eventually lead me to Route 193 close to the seaside. 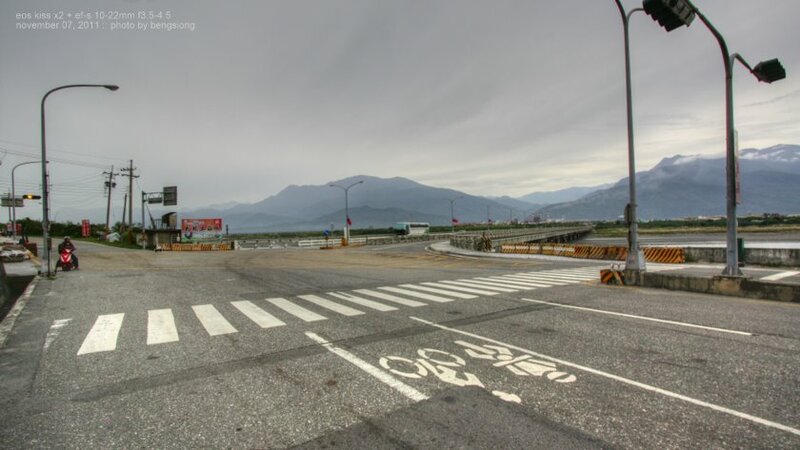 It was a short few kilometers ride on an uninspiring stretch of Route 193 before reaching the junction onto Hualien Bridge, which signaled the start of my ride along the coastline-hugging Provincial Highway 11. Right after crossing the Hualien Bridge, a light drizzle started to fall. Stopped at the side of the road to attach the rain covers onto the pannier bags. A short distance later, the drizzle started to get heavier. I made an unscheduled stop in front of the entrance to the Farglory Ocean Park, which is yet to open this early in the morning, to seek shelter from the rain. But after a few minutes of waiting, it is clear that the rain will not stop anytime soon – so onwards with the ride it is then as long as the rain is not too heavy. At around 21.8km (19km road marker) I reached the entrance to the first of three consecutive tunnels. These tunnels replaced an old road section that is now blocked off (towards the left in the photo below). Online, there is information from some cyclists who have chosen to cycle through the old road section, but from photos as far as 2-3 years ago, there were already extensive damages to a certain part of the road, with a large section of the road fallen off. Bearing in mind that the closed-off section is officially no longer maintained, unknown current conditions, the rainy weather, and being alone… into the tunnel it is then. Coming out after the third tunnels, it was a ~2km downhill roll into Shuilian village, but this was a deceptive relaxing portion because… past Shuilian, the route started climbing again up Niushan (literally Cow Hill), which, with the road peaking at around ~230m, is the only major climb along the Highway 11 route (that doesn’t mean the rest of Highway 11 are flats…). It was roughly a 5km+ climb, passing the Fanshuliao rest stop (looking back, I wonder why I did not bothered to stop here for the views??) before descending downwards. A short while later I came to a hairpin corner, where the Baci observation platform is located. Had a short stop here taking in the views (sadly, a gloomy day’s view with no blue skies). There is a small shop here, but it wasn’t open yet. At one point during the climb up, as I was passing an old woman selling bunches of bananas by the roadside, she remarked to me on how nice the weather was for cycling (the air was cooling, and the drizzles was taking a short break at that time). Yes, nice… but I chose to cycle the coastal route for the view of endless blue sea and blue skies, which never materialized throughout the entire trip. Progressing further, it was mostly downhills until the road levels out leading past Jici beach. 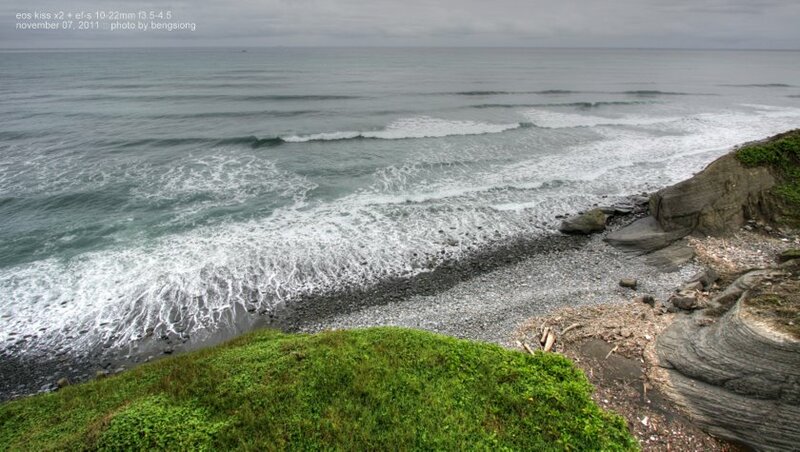 Taiwan’s coastline is mostly rocky features in most places, and sandy beaches are somewhat of a rarity here. Jici beach is one of those, and the place appeared to be fenced up and charges for entrance to the beach area, although it was deserted when I was there, mainly due to the time and season/weather I guess. The next 12kms of road passed though sparsely populated areas, with random bunch of buildings popping up into view once in a while. Along the way, at around 43.6km into the trip, there was another short tunnel (Panoramio photo) encountered. The drizzle started picking up again as I was approaching Fengbin town. Around here is the junction into Highway 11A branch, where one can cross over the mountain range into Guangfu town, though I’m not planning on taking this route. There is a 7-11 store available in Fengbin town. Note that many of the 7-11s on the east coast area here provides a pump (with pressure gauge) for cyclists to use, as well as toilet facilities in additions to other usual conveniences. It was around 10.30am when I pulled in to this 7-11 store after ~53km travelled, and the drizzle outside was getting heavier again. Had a light meal of onigiri and a large cup of hot City Cafe’s Latte while seated at the glass front, watching the raindrops assaulting the tarmac and traffic passing by (not that there’s much anyway), and stocked up on additional bottles of Supau and plain water as well. Subsequent 12km into Shitiping Harbor was also sparsely populated, with the mountain range close on the right and the (drab-looking) sea on the left. Oh, let’s not forget the raindrops coming from the top side as well… The odometer/speedometer malfunctioned shortly after the Fengbin stop, and I lost track of my speed and distance travelled from there onwards. This was later traced to shorted contacts due to water seeping in underneath the unit. Rode past Shitiping Harbor without detouring in due to the gloomy weather, but still headed into the area with rocky outcrop features next to it. There is also a campsite here with a number of roofed wooden platforms for setting up tents and toilet/bath facilities, as well as a few other buildings that appeared to be some sort of hotels/guesthouses. Wasn’t bothered to find out the pricings though. On a side note, I had my bulky and heavy DSLR along on the trip. Originally I had planned to carry it along hanging on one side of the shoulder, ready for a shot anytime, with straps on the backpack to secure it from falling. I tried it on a shorter ride for couples of hours along the bike paths while in Kaohsiung, and it feels fine for longer periods as I’m not riding fast anyway. But that was on a bright sunshiny day. An additional 4km later saw me passing underneath the arch of the red iconic Changhong Bridge at the mouth of the Xiuguluan River before taking a turn back onto the old bridge nearby. Here, the wind was blowing pretty strong, causing me to start feeling a little cold – so out came the windbreaker for the rest of the ride today. From here on, I’d be leaving Highway 11 for the day and heading inland into Ruisui town in the East Rift Valley area via Road# 64, a.k.a. Ruigang Highway. It is a small 22km+ road mostly following alongside the river, and although there isn’t really any road shoulder, there’s very few vehicles passing through anyway. 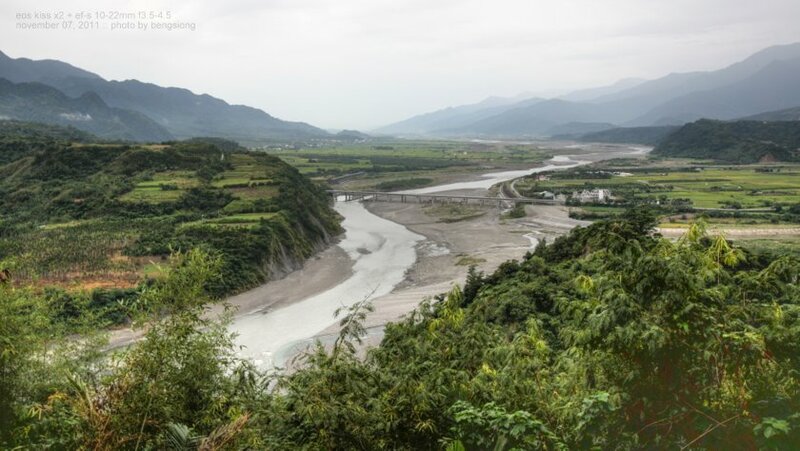 Xiuguluan River is famous for river rafting activity, which starts from the visitor/rafting center by the Ruisui Bridge in Ruisui and ends at the Changhong Bridge. Around halfway is a small settlement called Chimei village. Although I see what looked like a small convenience store at a road junction, it wasn’t open, so probably make sure you have enough drinking water if you’re going through this route. It was around 2 hours+ later that I reached the highest point on the Ruigang Road, which was also the last peak to climb before speeding down the remaining road into Ruisui (yes, very slow, I know…). Passed by 3 other cyclists going the opposite way around here (also carrying panniers). Dropped by the Giant Ruisui store near the train station for a quick bike check-up to ensure no issues, as well as getting the chain re-lubricated. By the way, in Taiwan, it seems that the local train station is a good reference point to find one’s ways around wherever there is one, as there is usually adequate signboards pointing to the train station, and there will invariably be some shops, food and accommodation options available surrounding each stations. Stopped by the 7-11 store nearby afterwards to stock up on more drinking waters, and decided to grab something to eat for an early dinner. I had been wanting to try one of those rice meal boxes that you can get at the convenience stores here, and settled on having that for today. I grabbed one of those with a huge piece of fried meat, and, well… frankly it is pretty tasteless even when already tired and hungry, and sufficed to say that I would rather not be eating anymore of those anytime soon. Just give me the ‘Basil Pork Cutlet’ burger that they have next time, which IMHO is pretty good and I had that many times throughout the entire Taiwan trip – although at 48NTD it is a bit on the expensive side. While enjoying (duh!) the not-so-nice rice meal, a little girl was seated next to me. Overheard her saying to her mom (probably because it’s still too early for a dinner proper): “uncle cycled until very hungry, so have to eat…” (probably lost in translation, but it sounded very darndy the way she said it in mandarin at the time). So, basically for the whole of today my meals all consisted of convenience store fares. How nice… let’s not do that again tomorrow, dear. Well, except for the latte at 7-11’s City Café, of course – I need my daily caffeine. Afterwards, I crossed the railway track after a nearby road junction to the rear side of the railway station, and headed further inwards on Wenquan Road towards the hot spring area. There are various hot spring hotels/resorts around here, but the 2 oldest ones are Ruisui Hotspring and Hong Ye Hotspring. Ruisui Hotspring is located closer to town, while Hong Ye Hotspring is located further in, crossing a bridge over a river. It was a few kilometers of slight uphill roads from the train station before I reached Hong Ye Hot Spring, passing two more Family Mart stores along the way in addition to the one opposite the 7-11 earlier. By the way, there is no English signboard pointing there, although helpfully, it is located at the end of the road after crossing the bridge (I had expected there to be an English signboard, and hence did not memorize the correct Chinese characters for the place’s name). An old lady seated at a nearby building helpfully gestured towards the location of the reception desk after seeing me arriving there and looking confused. The cheapest accommodation option here is the basic Tatami room, which costs 500NTD per person (not per room). It is sort of a dorm-like option, but per what the person at the counter explained to me, you get a room to yourself even if you’re coming alone, and not having to share with other strangers. The room that I got can probably sleeps up to 3-4 persons on the floor. There are apparently bigger rooms to accommodate larger groups of people. The room had a TV, ceiling fan and cupboard in addition to pillows and mattresses to spread out on the tatami-mat floor. The price also includes usage of the hot spring pools, which is pretty good bang for the bucks for solo travelers. They also helpfully allowed me to store my bicycle in a separate unused room. There are also better rooms available here if that’s what you prefer, though I’m not sure of the pricings. Great write up. Glad you enjoyed it. do u mind sharing the bike shop's address in hualien n contact no? for the Giant store near Hualien train station, their phone number is +88638336761. the address is No.35, Guoxing First Street, Hualien City. coming out from the Hualien train station, it is located at the nearby building on the left side. they also have a website at http://tw.myblog.yahoo.com/giant-hualien but it is not updated much. Hi Beng Siong, I am keen to do the same cycling trip. I am a novice though. Can I get in touch with you for some questions? hi Terence, sure, but how do you want to get in touch with me? Maybe you can message me thru Facebook (link at sidebar). Hey, great blog! I'm thinking of doing the same route but in the other direction. I rang a store listed in Taaitung but they said the don't hire bike. I'm wondering if I had the right store. Do you have an address for it? hi Tom, the Giant store next to Taitung train station, phone number is 089-235879 (+88689-235879 if calling from outside Taiwan). This was the number I had from 2 years ago, not sure if still current or not. Thanks for the detailed post! Do you still recall how long it took your the cover the distance from Hwy11 (ChangHong Bridge) to RuiSui? hi ling, probably around 2 hours to ruisui town. the hotspring area is a little further inwards past the train track. Hi Beng Siong. Thanks for the great info! I will be doing a cycling trip in Taiwan soon and i would need some advices from you. Is it ok for you if i engage you through Facebook? Your help would be greatly appreciated. Thanks for writing this blog, the information is priceless.